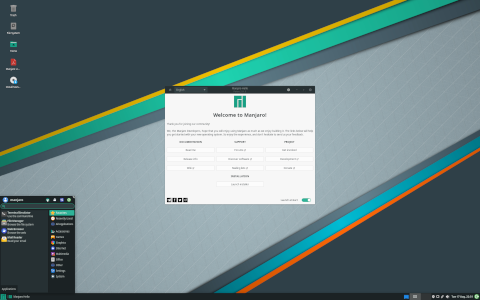 Rate this project Phil Müller has announced the release of Manjaro Linux 0.8.10, the latest update of the Arch Linux-based distribution that comes in KDE, Xfce and Openbox flavours: "On behalf of the Manjaro team, I'm pleased to announce the release of Manjaro Linux 0.8.10. Our team has worked hard over the last three months to put together the most refined and user-friendly Manjaro release to date. This release includes our flagship Xfce edition, feature-rich KDE edition, lightweight Openbox edition and our minimal 'Net' edition. Although the general layout of our supported environments has not changed dramatically, there have been look-and-feel improvements, including a modern graphical bootsplash, new default theme (Menda) and a new look for our welcome screen." Read the rest of the release announcement for a full list of new features. Download: manjaro-kde-0.8.10-x86_64.iso (1,556MB, SHA256), manjaro-openbox-0.8.10-x86_64.iso (687MB, SHA256), manjaro-xfce-0.8.10-x86_64.iso (1,186MB, SHA256).